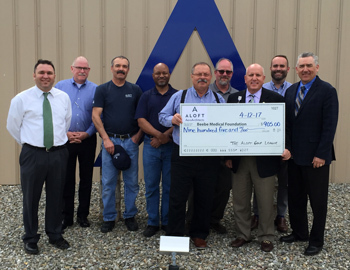 ALOFT AeroArchitects of Georgetown presented a check to the Beebe Medical Foundation on Wednesday, April 12. The funds, raised during ALOFT’s Golf League Family Outing at Rookery North golf course, will be donated to Tunnell Cancer Center. Shown (left to right) are ALOFT team members Bryan Ochs, Mark Ryan, Van Johnson, Erik Lester, Joe Reinhardt, Shawn Appleby, Tom Protack of Beebe Medical Foundation, VP of Development for Beebe Medical Foundation, Robert Sundin, President and CEO of ALOFT, and Matt Hill. Additional ALOFT team members were unavailable for the photo. ALOFT AeroArchitects, formerly PATS Aircraft Systems, is a long standing VIP aircraft supplier with roots in specialty aviation component manufacturing. Dating back nearly 40 years with roots in complex engineering and certification of advanced aircraft systems, Aloft AeroArchitects has provided PATS Auxiliary Fuel Systems and other integrated systems and components to most aircraft OEMs and hundreds of aerospace customers. After decades of providing kits to the retrofit market, in the mid-nineties ALOFT AeroArchitects began to provide Boeing and Bombardier with PATS Auxiliary Fuel System kits that would become the “legs” of their factory-delivered, high end, large business jets. In 1998, ALOFT opened its facility in Georgetown, Delaware that includes a 7-hangar facility adjacent to the primary runway at Delaware Coastal Airport. Beebe Medical Foundation is proud to accept this gift on behalf of Tunnell Cancer Center.